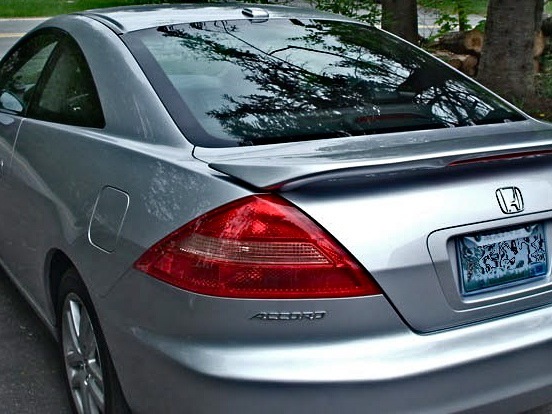 You will notice that several of the photos are actually pictures of tree branches mirrored on the car’s finish. Although not included here, the first time this happened was when I was at a car show and these photographers were trying to take a picture of my car for a T-shirt. It was soooo shiny that most of what we saw were other cars in the show parked next to mine. The reflections were so distracting they totally ruined the pictures for the shirt! The color is called Aqua Blue Metallic, a very limited color. I added flames to the lower body panels and center section of the hood along with numerous other cosmetic touches. Although I have used soapy water to remove bug & road goo on a couple of occasions, I have NEVER washed the rest of the car with water. Since the day it came off the train the car has always been cleaned and polished with Wet Paint. 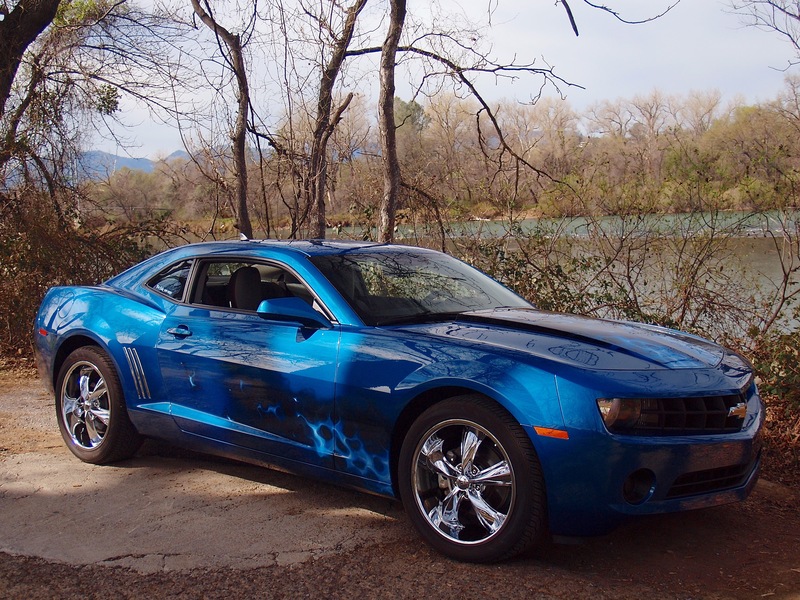 Although I don’t drive it in the rain…well hardly ever…water slides off the car effortlessly. 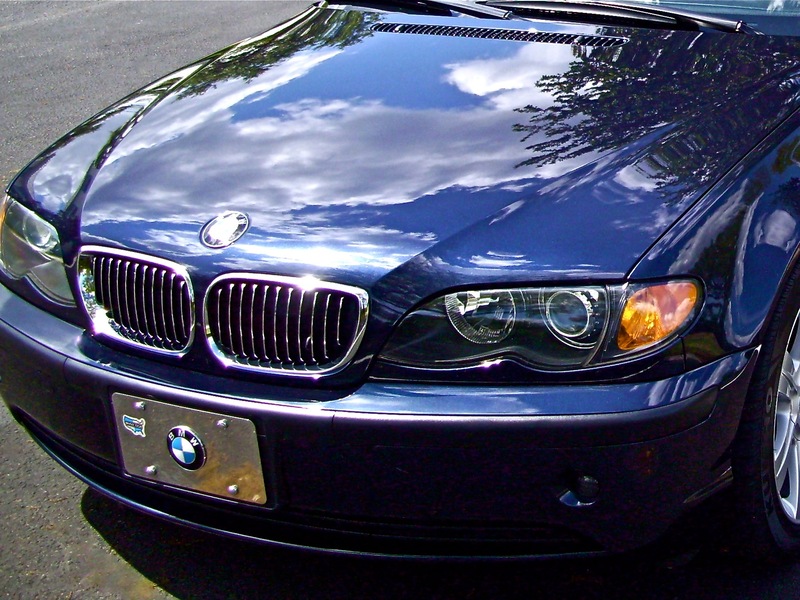 The car is much shinier than when new. I wish I was a better night photographer. If I could send you a few pictures of it in the evening (without my flash going off) it absolutely looks like the car has a sheet of glass on it. It is truly amazing, more impressive even than the pictures of the tree branches. Wet Paint is a product for the ages—all ages in fact. This photo was submitted by a Florida octogenarian who recently discovered the 'fountain of youth' for his prize 2003 BMW 325i Sport Wagon. "Steve, I am an 80-year old car guy and have been cleaning cars for a long while. 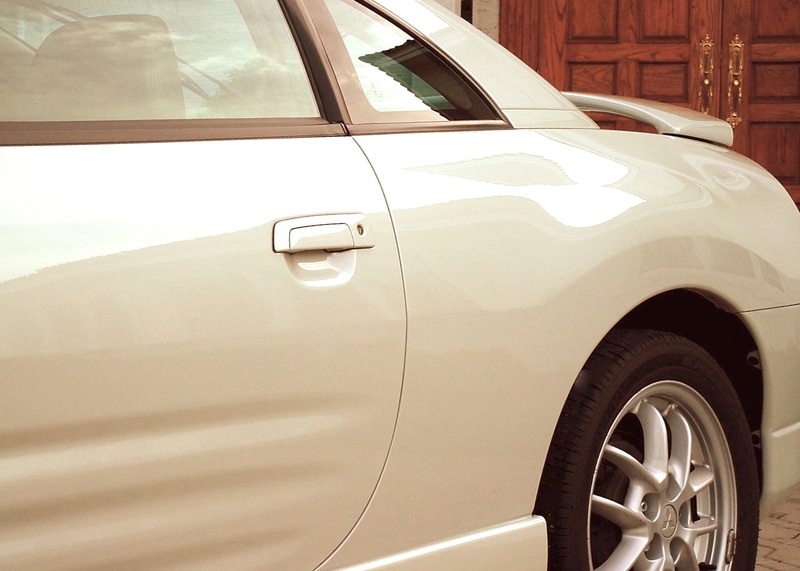 I am always looking for the best and easiest way to keep my cars clean. 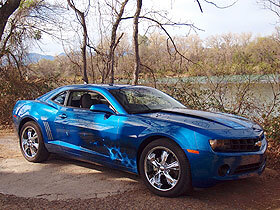 Your WET PAINT is the only product I have found that will do the entire car without using water. You can see the great results. ---------- WOW----------"
I just wanted to send quick greetings and say that you guys and gals have come up with the fastest and easiest way to get the ultimate shine out of any type of paint. I know you guys probably hear this a lot, but hey, it never hurts to hear more praise. 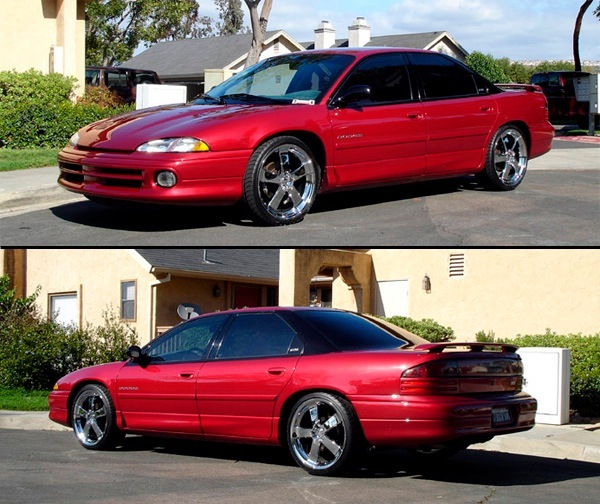 I was very skeptical about using it on silver paint since there were only 1 or 2 similar colored cars (Eclipse and Corolla I think) on your web page. Both cars look pretty nice, but the way the photos were taken didn't show off how nice a job the Wet Paint Glaze really does. It's hard to capture, but I included a macro shot so the depth can sort of be seen. 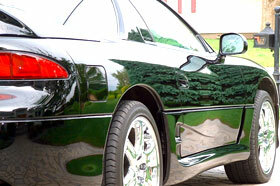 I applied Wet Paint to 3 cars in roughly an hour with some breaks in between……a Honda Accord coupe (Silver), Chevy TrailBlazer (Black) and a Jeep Cherokee (Green). The Blazer and Jeep had neglected paint and have been through some pretty harsh Maine weather, but this product has brought them back to life. Anyway, cheers for such a great product. The ol' cars sure do love it! That's why I've been recommending it to everybody. 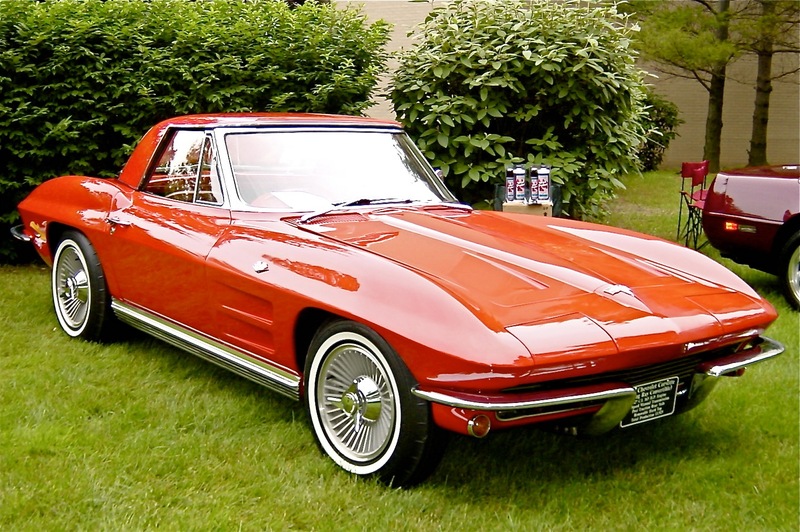 After sending a written testimonial some time back, Kevin Meyer of Swartz Creek, Michigan decided to back up his claims with a photo of this gorgeous 1964 Corvette Sting Ray. The picture pretty much speaks for itself, but in case you're interested, here's the text of Kevin's original letter. The opening sentence is in reference to THE WET PAINT STORY located elsewhere on this site. "Wow! I could have written your story for you, verbatim. Reading it for the first time today gave me goosebumps, and this is after using the product for nearly a year. My new neighbor's truck was ten years old, black, and looked fantastic. Yet, I NEVER saw him wash it or wax it. How could this be? I have since resorted to the same simple method of recommending this product to my friends as he used on me. After a brief but effective demo, I give them a small amount to keep and use. I tell them, 'Come back when you love this stuff, and you will.' Only then will I sell them a bottle of their very own. AT COST! Isn't it ironic -- a product so good at what it does that the benefit of using it and sharing it with others is worth more than making a couple of bucks on top of your costs. Simply put, I am a SERIOUS, short time, TRUE BELIEVER!" Chip Saxton is the owner of a water-softening business here in Elbow Lake and the inventor of an ingenious automatic water filtration system that actually cleans itself according to a pre-set schedule. As a result, the filter NEVER needs replacing! In fact, two years ago we installed the industrial version of this system in our production facility and were ecstatic to see filter maintenance drop from “always” to “zero”. 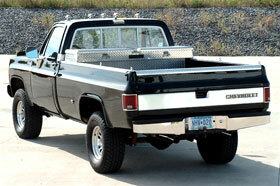 Now, it so happens that Chip also owns a really cherry 1976 Chevy pickup. When asked if we could photograph his ‘hotted-up’ beast for our website, Chip replied, “Certainly,” and dropped it off at our doorstep the following morning. Unfortunately, the photos turned out so well that it became difficult to pick a winner; therefore, we decided to provide two pix for the price of none. 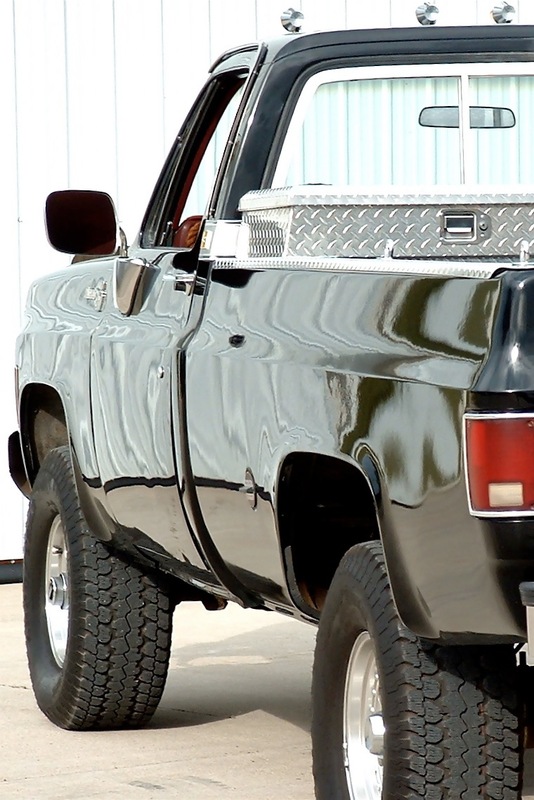 No, the paint on this decades-old Silverado isn’t original, but it’s been on the truck since before Chip bought it, and that was over seven years ago. Besides, it really doesn’t matter when it was repainted because it surely never looked as good as it does now with its multiple layers of Wet Paint. Great job, Chip! 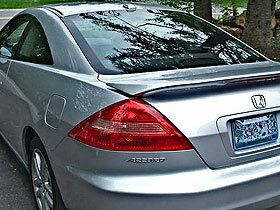 The current owner of this 2002 Mitsubishi Eclipse requested that we not publish her name or address. 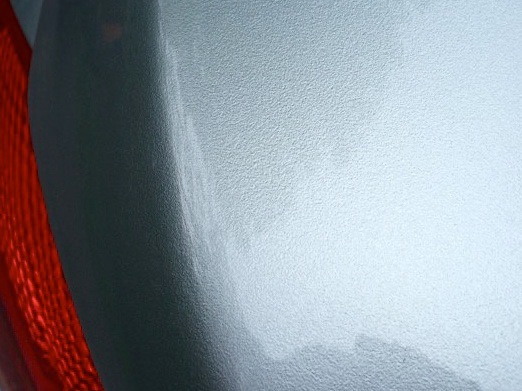 She was, however, eager to share the following thoughts regarding a recent discovery: “I’m really impressed with the ‘wet look’ your product produces…something I thought would be next to impossible on a light-colored car. 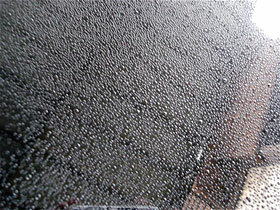 I also like the job it does on glass and the way rain disappears from the windshield when driving down the highway. One morning last week, I went to the garage after driving home in rain the previous day. Except for some road film along the bottom, the car looked almost as clean as it did the day before. Well done, guys! I wish your product were easier to find in stores though so I could recommend it to more of my friends.” Thanks for the kind words, ‘Dakota’. Sorry about the ‘unavailability’ thing, but please feel free to recommend our TOLL-FREE number to all your friends. That way, we can ship Wet Paint directly to their doorstep. This photo was submitted by Gary I. of Minneapolis, MN. 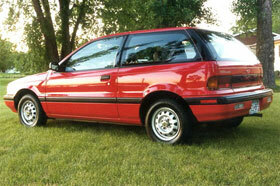 Gary says, "My 1990 Dodge Colt looks better than the day I bought it new; and the only time I ever wash it is during winter when the roads are full of salt." Nick Punnett of Las Vegas, NV submitted this photo of his pet ‘goat’ along with these unabashed words of praise: “I discovered your product around '89 or '90 from a vendor booth at a car show in northern CA. I had recently finished restoring a ‘65 GTO for myself for show. 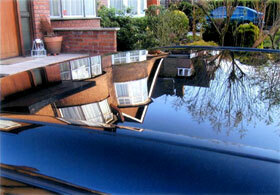 The black paint was not urethane; rather I had had success using a softer modified acrylic enamel I used on show cars. Didn't have the hardness and durability of urethane, but color-sanded and buffed to an exceptional gloss and finish. I used a large number of waxes and polishes trying to find one that didn't leave streaks or smudges on the unforgiving soft black finish. After finding Wet Paint, I have used it exclusively for 14 years on the same black paint I laid down in 1988. No smudging or streaking and the gloss is amazing on 14-year old paint. Admittedly, it is a pampered show car, but it still shows very well. 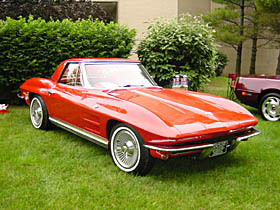 Last week, after a coat of Wet Paint, it took 2nd place in the best paint category at a large local show. It's the best product I have found. I am reordering right after I send this e-mail. Thanks!” Nice work, Nick! We’re not trying to sound boastful, but perhaps a coat of our new formula Wet Paint will help make up the difference between 1st and 2nd place. Thanks for making such an amazing product. 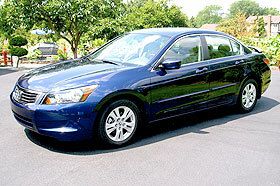 This 2008 Royal Blue Pearl Honda Accord is my first car and this is my first time using Wet Paint. I was so amazed at how much the car shined in my dimly lit garage that I decided to put on a second coat right away and the results were beyond words. The car is only about 9 months old, but never shined this much. Thanks again!!! 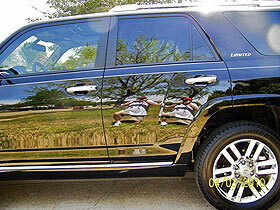 Message to L.F. – That’s not a shine, dude; that’s a mural on the side of your 4Runner. Awesome! Click on the image to see a larger view This '57 Chevy is owned by Mark Zakoski of Moosic, Pennsylvania. 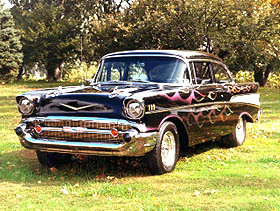 Mark spent three years modifying and restoring this beautiful classic, and his father, Hank, did the paint and body work. The flames were sprayed in various Lite Interference shades that change color depending on the viewing angle. Hank says, "We use WET PAINT on this car exclusively. 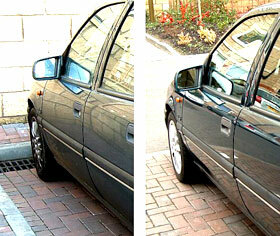 All exterior surfaces including wheel openings and undercarriage are cleaned and protected with WET PAINT." 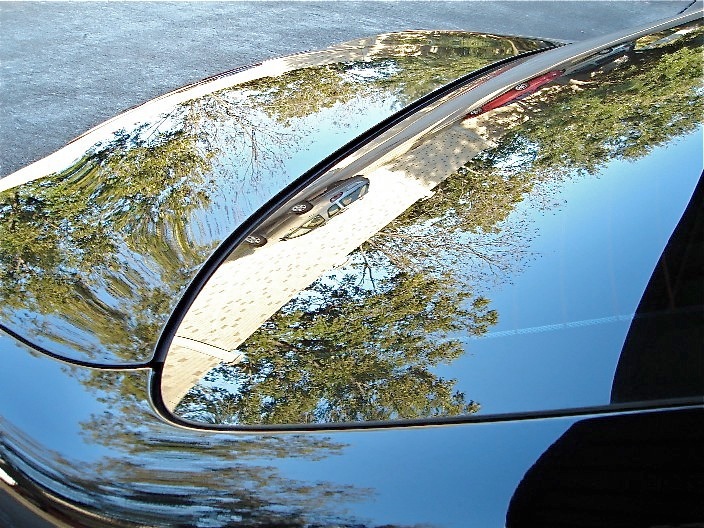 Although the sun wasn’t in the proper position to reveal the extraordinary depth and shine of this beauty, check out the “leaf reflections” on the lower portions of the door and rocker panel. Not many cars are capable of reflecting leaf images from such a distance! 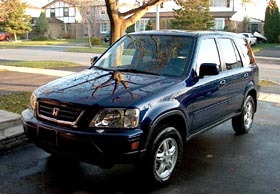 Rob Kovalik of Mississauga, Ontario, Canada submitted this photo of his wife's dark blue Honda CR-V. Along with the photo came an 18-page evaluation of Wet Paint!!! Rob has tested dozens of products over the years, including products intended for professional use only. What follows is a small portion of the many good things he had to say about Wet Paint: "My wife's blue Honda CR-V looks like a pool of water! This is the easiest product I have used and the brightest shine I have seen. Definitely a concours capable product! It can be used as a wax, a quick detailer, a glass cleaner and a rim polish. This is a very versatile product that just works." Robb rated Wet Paint’s performance from 1-10 in the following categories: SHINE = 10, DEPTH = 8, APPLICATION EASE = 10, DRYING TIME = 10, REMOVAL EASE = 10, COST EFFECTIVENESS PER APPLICATION = 9, APPLICATOR = 10, SMELL = 8. Altogether, Wet Paint received 75 out of a possible 80 points and a big “thumbs-up” from Robb. Not bad at all, but it looks like we’d better get to work on the five points we missed. (Note: In April of 2005, Wet Paint was reformulated for the 13th time. Judging from the reaction it received from professional auto detailers, we believe we met our design goal of increased paint depth & gloss. In addition, Wet Paint is now easier to wipe off than ever. This begs the question: Is it possible to achieve a score of “11” in the category REMOVAL EASE? "To say that I am impressed with your product is the understatement of the decade! Normally, light colored cars, like my significant other's '03 Toyota Corolla, just don't REFLECT very well, but Wet Paint has proven that 'dead wrong'. (See enclosed photo.) As for using it on glass, well, it just seems to disappear. WOW!! 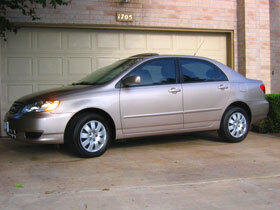 After achieving spectacular results on the Corolla, I decided to use Wet Paint on my '04 Honda Accord. Again, the outcome speaks for itself. And all this with only one coat! Can I do a second coat immediately or do I need to wait? If so, how long should I wait? Thank you for a product that actually exceeds expectations. 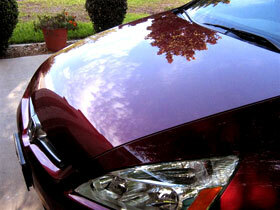 Wet Paint is truly a breath of fresh air in the 'I'm best' world of automotive shine products. Can I buy stock in your company? Thank you." "Yesterday, I picked up my new car at the Pontiac dealership. They told me they would clean and wax the car before I picked it up. Guess what? They spent two hours cleaning and waxing my car. When I got home, there was all kinds of rag dust and 'fuzzies' on the surface so I gave the car its first coat of Wet Paint. Every time I use your product I love it more. 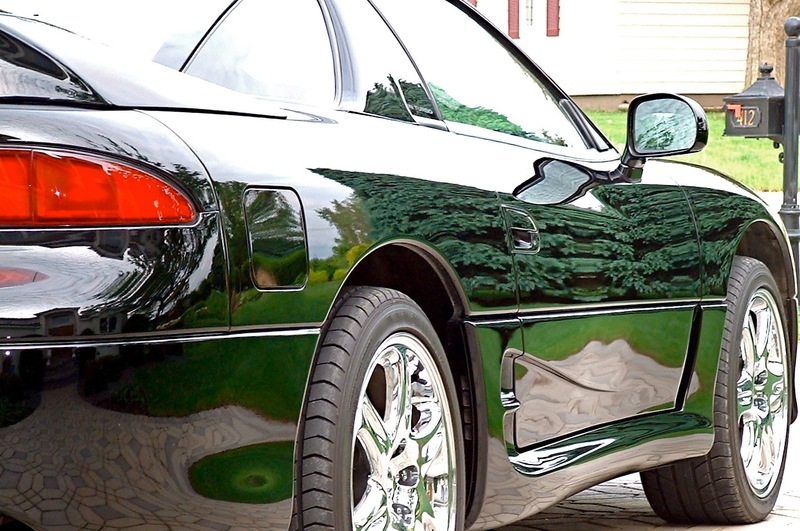 No rag dust -- the car just looks richer in shine and color. Thanks again for your fast and courteous service. Very HAPPY customer!" Tom A.; North English, IA. I just tried your product for the first time yesterday and I was pretty impressed with the results initially. I left it and then returned this morning to find my car absolutely DRENCHED in gloss. To be honest, I had really high expectations of your product and those expectations were definitely met. My friend was skeptical because he said that the testimonials on the site sounded mostly like salesmen, so here's a down to earth testimonial! Attached are two pictures. One is a hood shot showing how well the water beads and another one of the backside of my car which has turned into a mirror. "I just wanted to drop you folks a note of appreciation! 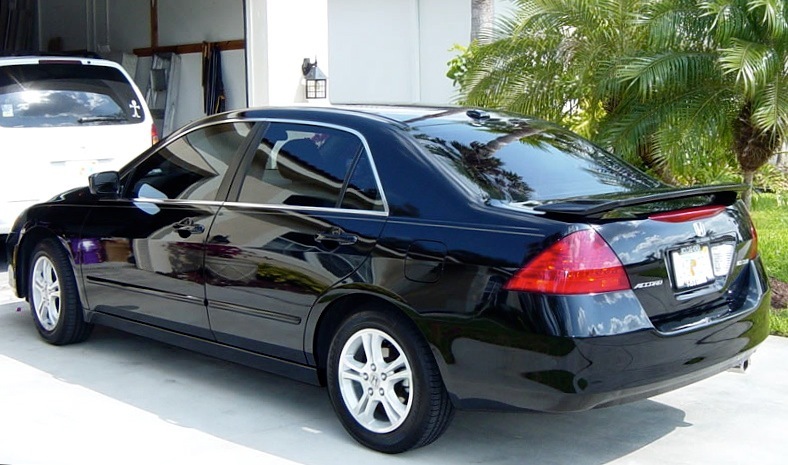 I just finished cleaning my 2006 Nighthawk Black Pearl Honda Accord with Wet Paint and I am still amazed at how well your product works!!! I've been using Wet Paint since February and it just keeps on getting better. I was a little skeptical at first that WP could do everything as promised, but it keeps on impressing me. Here's a couple of pictures of my Black Beauty. Keep up the good work!" 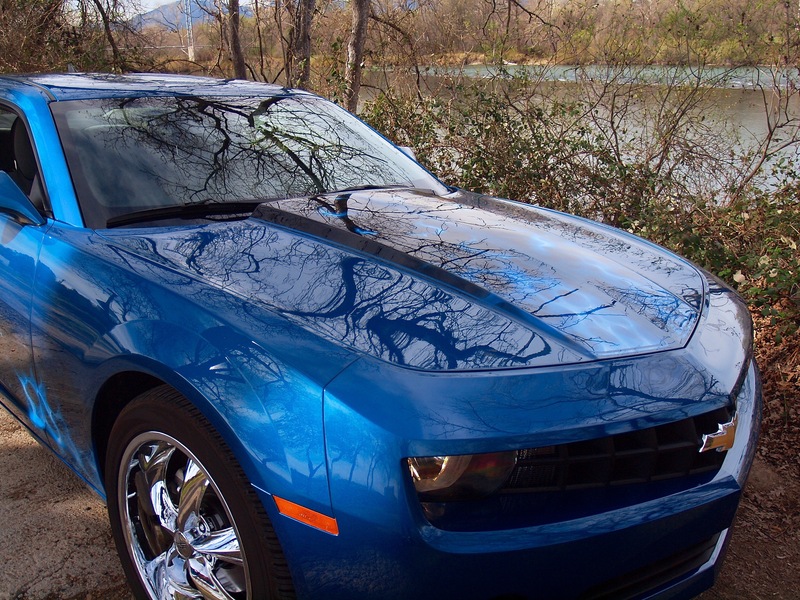 We should be saying the same to you, Paul…and by the way, your car looks incredible! Sorry we weren't able to run all four photos, but if THIS shot doesn't drive the point home, nothing will. And you say it just keeps getting better? Wow!